I am interested in getting a private city tour for my parents and I on November 30. We should checking into Beverly Hilton hotel around 2pm, and would be ready to embark on a sightseeing tour around Los Angeles by 3.30pm. Was thinking of a 5 1/2 hour tour. Could you kindly advise your rates and availability? Thank you for contacting us. Yes, we can offer you the best private tour of Los Angeles. Our guide can pick you up at 3:30 pm from Beverly Hilton hotel and start the tour. We will show the best of LA and will include driving along the coast in Malibu and Venice Beach, Santa Monica, Beverly Hills, and Hollywood. During the tour we will be visiting famous landmarks in Hollywood, Beverly Hills and Santa Monica: Mulholland Drive with a nice view of Hollywood Sign and Los Angeles skyline (stop there for about 10 min. 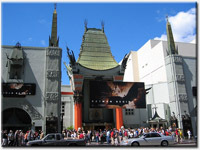 ), Mann Chinese Theater, Kodak Theatre, Hollywood Walk of Fame (stop there for 30 minutes). By taking famous Sunset strip we will be passing through Rock Walk of Hollywood with famous rock and pop bands hand prints (stop there for 5 minutes). Then we will proceed to Rodeo Drive in Beverly Hills and Bel Air (stop at Rodeo drive for about 30 minutes). After that we will stop at Santa Monica Pier and Promenade for 30 minutes. You will have a multiple stops with photo opportunities along the route. Just remember we can customize our tour according to your preferences. Our guide will discuss couple of points before the tour and will take you there with live sightseeing commentary. This tour will be approximately 5 1/2 hours. We charge $60/hour. We will drop you off back at your hotel at 9:00 pm. For this private LA city tour, you can submit our online form with all the details here book private Los Angeles tour. Please pick “Private Tour - $60/hour” and in ”Comments” section you can write any additional details. We will send you a confirmation after that.